What Does a Neurology Nurse Do? Do you want to know what a neurology nurse does? If you are a nursing student or you work in the field of nursing as a standard direct care professional, you may be interested in pursuing a specialty so that you can feel more fulfilled and earn more money over the life of your career. As a neurology nurse, you will work closely with a neurologist and his or her team to provide care to patients who are being treated in a neurology unit. Neurological nursing can be a very challenging specialty, but a great opportunity for professionals with the right skills. Read on, and learn what you need to know about nurses who practice in this area. Who Will Neurology Nurses Work With? If you become a neurology nurse, you will need to specialize in neuroscience and treating patients who have been diagnosed with brain and nervous system disorders or who are showing symptoms of neurological problems due to a traumatic brain injury. Because anyone at any age can suffer from neurological problems, a neurological nurse specializing in treatment and care in this area of medicine can expect to work with patients in every age range. Because of the condition of many of the patients, it will take a professional who is able to maintain a high level of sensitivity and compassion for patients who cannot function normally or mentally focus. In some cases, patients may lack communication skills and motor skills. 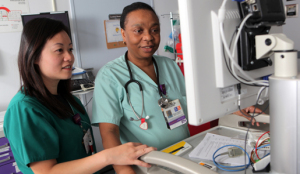 What Are the Duties and Responsibilities of a Neurology Nurse? When you are working as a nurse who specializes in treating patients who suffer from neurological diseases or damage of the brain or nervous system no day is the same. You may work with a patient who has a brain tumor one day, and a patient who was involved in an accident that resulted in traumatic brain injury the next. No matter what type of patient you work with, you will be helping the patient manage their pain so that they can recover and improve their mental, physical and cognitive abilities. In a neurology unit, you may give immediate care to patients and post-operative care. You will assess patients, much like a general nurse does, and administer tests and medicine as ordered by the neurologist you report to. By the side of a neurological doctor, you will perform tests and procedures to monitor neurological activity or to treat a specific condition. You may also be the one who speaks with family to tell them about the patient’s condition or how they have progressed since they were admitted. Many nurses educate families on how to care for their loved one once they leave the hospital. Who Should Become a Neurological Nurse? It takes a special individual who is compassionate, sensitive and patient to work in the neurology unit. If you can work in high-pressure and emotional situations where you need to maintain your stamina and stay focused on the details, this could be the right field for you. If you would like to work in an neurology unit, you will need the same basic training as a Registered Nurse. You can improve your chances of landing a position by testing for your Certified Neuroscience Registered Nurse credential through the American Association of Neuroscience Nurses. Now that you know what a neurology nurse does, you can decide if this is the sub-specialty for you.